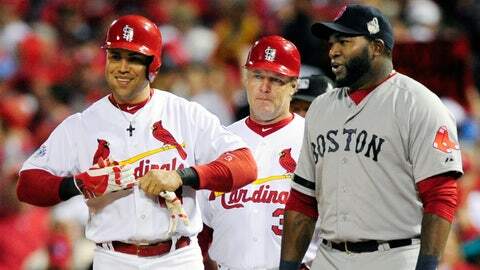 Looks like Carlos Beltran and David Ortiz will be seeing a lot more of each other in the future. Nearly two weeks after agreeing on a three-year deal, outfielder Carlos Beltran and the New York Yankees have finalized the contract worth $45 million. The 36-year-old played for the Mets from 2005-11, until he was traded to San Francisco before the 2011 trade deadline. He signed a $26 million, two-year contract with St. Louis before the 2012 season and reached the World Series for the first time this past season. Slowed by knee injuries, Beltran has retained a potent bat â especially in October. He hit .296 with 24 homers and 84 RBI for the Cardinals in 2013 and added two homers and 15 RBI in the postseason. Beltran injured ribs in the World Series opener when he banged into Fenway Park’s right-fight fence while robbing Boston’s David Ortiz of a grand slam.